Paper money has been around for a long time since it was used by the Chinese in the 7th century AD. Paper money has been issued in different parts of the world in different forms over time. Just like rare coins, rare paper money is valuable as a collectible item. 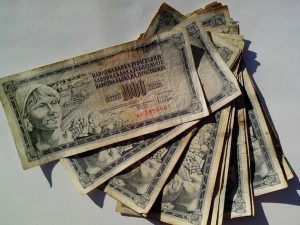 How do you know if the old paper money in your hands is valuable? • 1914 blue seals – Federal Reserve notes issued in 1914 with a blue seal. Those with a star symbol are rare and valuable. The Leeward Islands, Palestine, The Philippines, St. Lucia, Trinidad and Tobago, Bermuda, British Guiana, British Honduras, Turks and Caicos, and Zanzibar. Paper money has 4 kinds of values. • Retail price – what the dealer could sell you the bill for. • Wholesale price – the price one dealer offers another for bulk notes. • Rarity – how many notes are in circulation? • Condition – is the note good as new or tattered? • Demand – how many people are after the note? The issuance of the note will also weigh on its value. • Was it general issue or commemorative? • Who was the issuer? Is it a Federal Reserve note, Treasury note or what? • What is the date of issue?